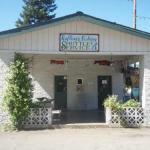 Budget-friendly accommodations with free Wi-Fi and a location near the Klamath River are the highlights of a stay at the non-smoking Forest Lodge Motel. At the single-story non-smoking Forest Lodge Motel 15 exterior-access rooms are air-conditioned and generously equipped with free Wi-Fi access microwaves mini-fridges and satellite TVs. Units with kitchenettes are also available. Pets are allowed for an additional fee. The Forest Lodge Motel is in Happy Camp California a mile from rafting fishing kayaking and swimming on the Klamath River. There are Native American events at the Klamath Siskiyu Art Center less than five minutes away and restaurants within walking distance. Klamath National Park is within an hour's drive. Happy Camp Airport is a mile away.